A very blonde, very beautiful Carrie Underwood walked down the carpet being seranaded by the fans singing "Before He Cheats." The photographers went CRAZY for her. She's up for both Song of the Year and Best Country Collaboration With Vocals among others. He didn't stop for interviews, but Ne-Yo did a lot of yelling, moonlwaling and waving to all of us. 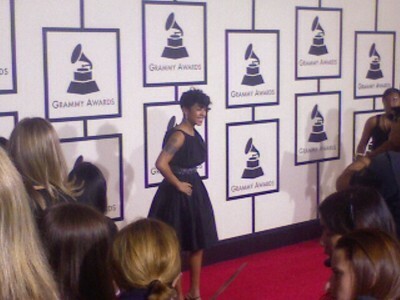 And last night, I couldn't get an answer but nominee Keyshia Cole is definitely in the house now! yay you got to see carrie!